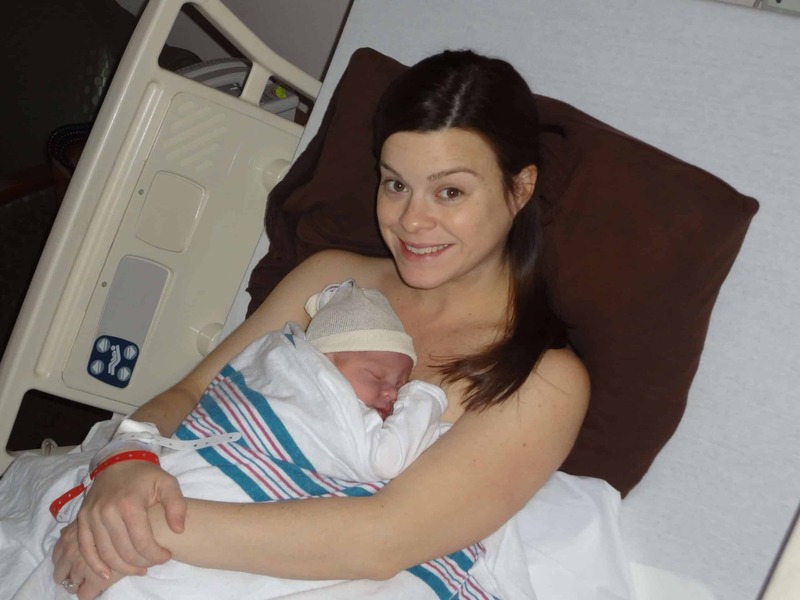 3.5 Hours after waking up to pressure waves…mom births her 9lb. baby! Kerry – I want to thank you so much for developing Hypnobabies. I loved every part of it and am so happy that I discovered it during my second pregnancy (wish I had known about it earlier!) Now that my beautiful baby boy, Hudson, is a month old I wanted to share his birth story with you. My first son’s birth had been a rough – his birthing time was about 21 hours and it was a painful birth. My husband and doula were amazing, but my OB was not very natural birth supportive and I felt overwhelmed trying to navigate everything I was feeling at the time. This time around I felt like I had an amazing tool that not only had a positive impact on Hudson’s birth, but a positive impact on me throughout pregnancy. A week before my guess date (Valentine’s Day!) I woke up around 5:30 having pressure waves about 4-5 min. apart and lasting about 45 sec each–although some of them were shorter. I had been having pressure waves on and off for the past week so I wasn’t sure if it was really “the day.” I lay in bed timing the waves for a little bit and then called Jeff, my husband, since he was two and a half hours away for work. I let him know that he should come up, but told him to take his time since I figured (based on my first son’s birth) we were in for a long day. Next I called my doula and found out that she was at another birth; amazingly I didn’t panic about this, thinking that by the time I needed her she would be on her way. When I called my midwife she told me I should probably head over to the hospital soon, but judging from my voice she didn’t think I should rush over immediately. My doula had said the same thing – that it sounded like I had a while to go. I listened to my birth day affirmations track, ate some toast with jam, and took a nice relaxing shower. My mom was over, the plan was for her to watch Gavin, my two year old, while we went to the hospital. I could tell she wanted to push for me to go to the hospital as soon as possible, but she let me do my thing. I give her a lot of credit for that! When she had me she barely made it to the hospital and she kept thinking the same would happen to me. The waves were gaining in intensity, but they were not overwhelming and I continued to easily handle them. We made arrangements to drop Gavin off at a friend’s house and got in the car. I had my headphones on the whole time – mainly listening to the affirmations and creating anesthesia tracks. On the way to the hospital the waves started getting much stronger and I started vomiting (thank God I had something to catch it in so it didn’t get all over my mom’s car!) – That’s when I started realizing that I was further along then I had originally thought. I couldn’t wait to get to the hospital so I could get in the tub. I had planned on spending much of my birthing time in the water and hoped for a water birth. Right when I walked in the hospital lobby I had a huge wave and dropped to all fours—that position just felt right and helped me get through that wave. Everyone in the lobby surrounded me and kept asking if I was ok and trying to get me up, I was just holding up my hand saying, “give me one second I’m fine – just about to have a baby.” When I got up they had a wheelchair and wheeled me right up to the room – I could hardly sit on that chair just wanted to get in the room and be by myself. The nurses were great – they left me alone at first. They started filling up the tub and I just sat in the bathroom in the dark to gather my thoughts and be alone for a few minutes. My doctor came in the room to check me, and I was positive she was going to say I was only 3 cm and she says “yes, you are at 8.” I must have asked her to repeat that two more times, I was in shock. Whenever I did my Visuaizing Your Birth CD during my pregnancy I had always imagined getting to the hospital at 7 or 8 cm. But, consciously I never really thought it could really happen! I didn’t even have time to get in the tub. Ten minutes later it was time to push. At first I couldn’t quite wrap my head around the fact that it was already time; my husband wasn’t even there yet! I knew he was going to miss the birth, but Hudson was ready to come. During Gavin’s birth I had pushed for over two hours; Hudson came in about 5 pushes. I remember my mom holding my leg during one of the first pushes with this huge smile on her face, “I can see his head!” My mom was such an amazing support (even after my water broke all over her feet!) especially since she had not planned on being there. But, I can’t imagine Hudson’s birth having happened without her. Actually being able to feel the urge to push this time was amazing– everything actually made sense. After having an epidural the first time I felt like I never understood how to push. But this time my body told me what to do. We didn’t have time to put on the Pushing Baby Out track and I never went over the Hypnobabies cues with my mom, but I had the cues in my head and just kept trying to go back to them. Everything went so fast; I can’t even explain the wondrous sensations I felt physically and mentally feeling Hudson be born. His face was all bruised and blue at first, but soon he started making his first sounds and looking all around with his big brown eyes. Hudson was born at 8:53 a.m. A little under 3 ½ hours from when I woke up and less than an hour from arriving at the hospital! What a difference from twenty-one hours the first time! About 20 min. later my husband walked in the room and did a complete double take seeing his baby boy already here! I think I must have been having birthing waves in my sleep that night and just slept through them. I credit Hypnobabies with the fact that I was so relaxed when I woke up; I know that it helped my body to relax and work quickly. I was so confident in myself this time.